Bottom Receiver Opening is 2"
Extension towing capacity up to 12,000 lbs. with 48” SuperTruss receiver extension. Designed for up to 12’ campers. 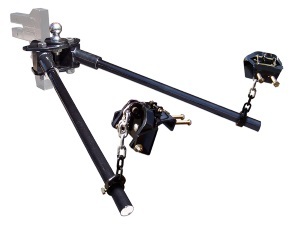 It comes with a hydraulic spring bar tension assist to avoid manual lifting of the tension bars, adjustable chain collars for various mounting locations to get around jacks, battery packs or anything else affixed to the tongue. It works with the SuperHitch Magnum Only. The SuperHitch Everest is proudly made in the USA.